A short-lived experiment, this will be the final “This Week in the Prison Industrial Complex” entry. When it began, I suspected I may have assumed too intensive of a task. At present, it has turned out to be too difficult to maintain this weekly chronicle. I hope that it was helpful while it lasted. I will continue to examine the prison industrial complex (PIC) and related issues in other posts, as well as sharing more timely PIC news on Twitter. On August 12, Hugo “Yogi Bear” Pinell was stabbed to death by a prisoner at New Folsom State Prison in California. Pinell was one of the San Quentin Six, part of a prison uprising and escape attempt in 1971 during which revolutionary prisoner George Jackson was killed by guards. 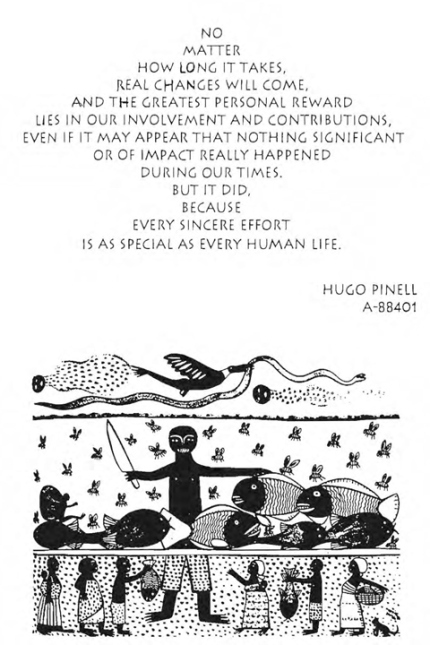 Pinell spent 50 years in prison, 46 of them in solitary confinement. From August 6 – 12, Israeli occupation forces arrested 41 Palestinian civilians, including 14 children, in the occupied West Bank, and three in the Gaza Strip. Meanwhile, RootsAction has an action alert for Chelsea Manning, who is being threatened with “indefinite solitary confinement” for trivial alleged offenses. August 23 – 30 is International Week of Solidarity with Anarchist Prisoners. Read the call out here. Hunger-striking Palestinian prisoner Mohammad Allan went into a coma on August 14, day 60 of his hunger strike. He emerged from the coma today and “declared in front of his doctors that if there is not any solution to his case within 24 hours he will ask for all treatment to stop and will stop drinking water.” Israel proposed freeing Allan if he is deported from Palestine for a period of four years. The Israeli Supreme Court will rule on Wednesday whether or not to release Allan on medical grounds. Allan is protesting his detention without charge or trial by Israel. On August 17, after 52 days on hunger strike, three political prisoners in Mexico announced an end to their strike, citing the difficulties they faced obtaining glucose from the prison officials. This entry was posted in Prison and tagged political prisoners, prison, prison industrial complex. Bookmark the permalink.